in the following states . . .
Request FREE Information Packet at Bottom of Page!!! Back to Pine Valley’s (6) Fundraisers!!! 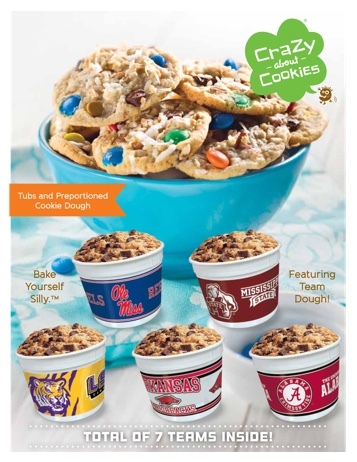 Printed on each of the above University Cookie Dough Tubs are the Official Team Logo and Colors. - Each of the tubs is filled with 2.7 Lbs. of Delicious Chocolate Chip Cookie Dough. - This Cookie Dough will last for 21 days at room temperature or 77˚F . . . and also can be refrozen. - Included in each of these brochures are other wonderful flavors or varieties of Crazy About Cookies Cookie Dough in Tubs and Pre-Portioned Pieces Preformed and ‘Ready to Bake’! • High School Athletic or • Sports Departments. Call us Now for Your Next Successful Fundraiser!